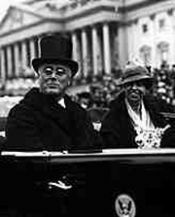 It was his second of four inaugurations; the first had been held fours years earlier on March 4, 1933. Roosevelt's first inauguration had been shadowed by the onset of the Great Depression—within a week of taking office, the new president had declared a federal bank holiday. 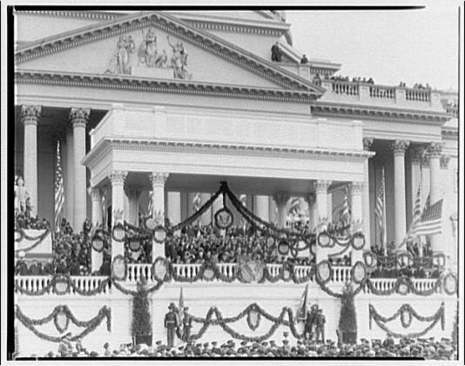 Roosevelt's Second Inaugural Address was optimistic about the gains that had been made during his first administration, while acknowledging that much more was needed. In his speech he shared his vision of the nation's potential and challenged Americans to continue in a united effort to address poverty. When Roosevelt was inaugurated in March 1933, the U.S. was at the nadir of the worst depression in its history. A quarter of the workforce was unemployed. Farmers were in deep trouble as prices fell by 60%. Industrial production had fallen by more than half since 1929. Two million were homeless. By the evening of March 4, 32 of the 48 states, as well as the District of Columbia had closed their banks. The New York Federal Reserve Bank was unable to open on the 5th, as huge sums had been withdrawn by panicky customers in previous days. Beginning with his inauguration address, Roosevelt began blaming the economic crisis on bankers and financiers, the quest for profit, and the self-interest basis of capitalism.